how thick you paint it. - High pigmentation loading giving very strong colour. Impasto Acrylic Colour is a professional non-fading grade artist acrylic colour that has been thickly formulated to offer a "bold superior 3D shape" retention for artist palette knife and brush strokes. 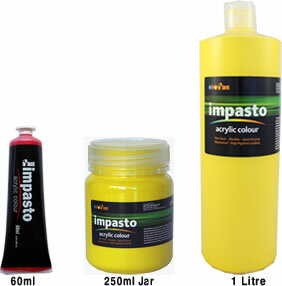 Impasto Acrylic Colour is built to last. Whatever the artist shapes and renders on the canvas, this thick bold impasto acrylic WILL stay exactly as the artist intended. Most other educational artist acrylics are weak in structure so they change shape as they dry, resulting in an non structured puddle with the look of melted ice cream . FAS Impasto is real "structured" quality at an educational price. Super strong thick structure, brilliant rich colours, high pigment loading, lightfast (non-fading), non-toxic, quick drying waterproof and permanent intermixable colour. It remains flexible once dry making ideal for large canvas artworks. Applied undiluted by brush or knife it gives a rich deep impasto finish that offers excellent shape retention without the need to use an impasto medium. The colours may easily be reduced with a medium or water to lower viscosities to allow the very subtlest of fine watercolour washes and glazes. Ideal for use on canvas, paper, wood, fabrics, plaster and more. 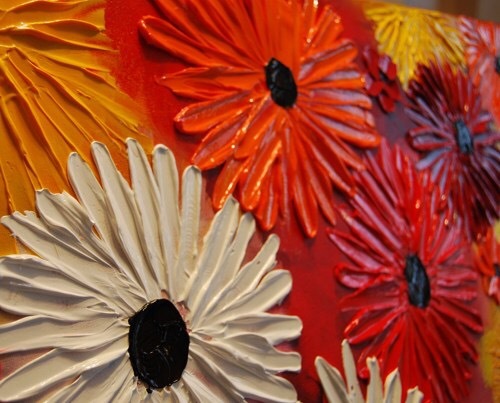 We recommend the preparation of the surface with a Gesso sealer undercoat first. The intermix-ability of the strong colours makes this an ideal paint for teaching and learning the art of mixing colours, producing strong secondary and tertiary colours. Wash up equipment with soap and water. As a precaution suitable protective clothing should be worn. Paint is permanent when dry. Single Colours: 60ml tube, 250ml and 1 Litre. Tube Set: 5 x 60ml tubes in carry pack. 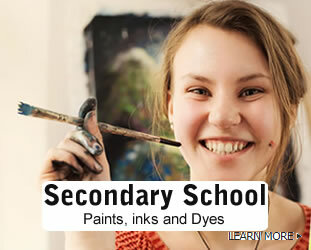 Health and safety is critical for educational paints. We have our paint independently tested in specialist laboratories to meet the current international standards. This product does not contain dairy/casein, egg, gluten, soy or peanut products, by-products or derivatives. This product does not contain latex materials or animal derived ingredients. All FAS packaging can be recycled. Bottles, caps and labels made from the same materials and can be can be recycled together.